Normal life was hit in Itanagar, The capital city of Arunachal Pradesh on the first day of 48 hrs bandh against PRC issue called jointly by 18 organisations. Normal life was hit in Itanagar Thursday as several students’ bodies and civil societies called for a 48-hour bandh, seeking changes in the proposals made by a government-appointed panel on the issue of granting permanent residence certificate (PRC) to non-Arunachalees. The Joint High Power Committee, after holding parleys with the stakeholders, has recommended granting PRC to six communities, who are not natives of Arunachal Pradesh but has been living in Namsai and Changlang districts for decades. The proposal has evoked resentment among several community-based groups and students’organisations, who claimed that the rights and the interests of indigenous people will be compromised if the state government accepts it. A senior officer said that the agitators, on the first day of the two-day bandh, hit the streets in the state capital and pelted stones at government vehicles, prompting the police to detain 27 of them. They demanded that the government reconsider the JHPC recommendations, which is set to be tabled in the Assembly during the ongoing interim budget session, he said. All business establishments remained closed Thursday and public vehicles stayed off the roads, Superintendent of Police M Harsh Vardhan said. 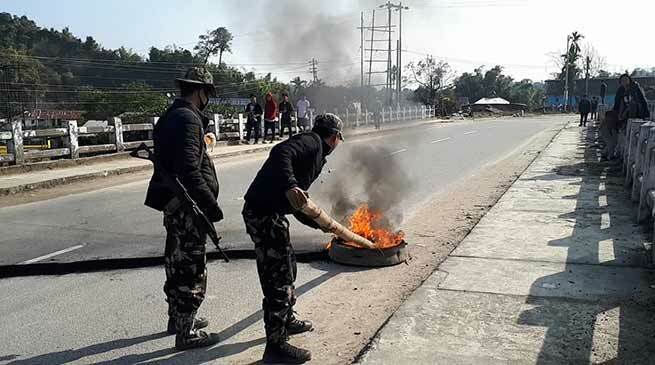 “Apart from a few stray incidents, no untoward incident was reported from any part of Itanagar,” the SP said, adding that the administration has made elaborate arrangements to ensure security of people during the bandh. I am requesting to the government with humbly to grand pcr, because we all are human beings.